So I’ve gotten into the bad habit of buying nut bars in a pack from the supermarket as an easy on-the-run snack. And lets face it, I probably still will at times, they are the least offensive of the snack bars in my opinion. But I thought I might at least try and make a healthier home made version. An dude, this is a winner! So, I just did this. 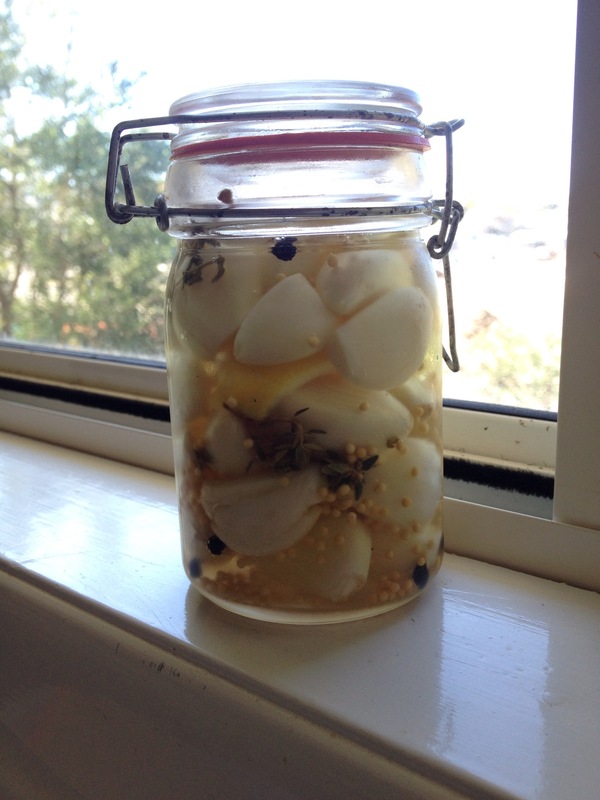 I had a few spare heads of garlic, because we get these food deliveries called Hello Fresh, and they give you a whole head every week.You can use it just like fresh garlic, but I remember eating pickled garlic straight out of a jar on a regular basis. It was just supermarket shelf stuff, so surely home made has to be better right?! Now, as you know, I’m not one to be particular about following recipes, so I read a few and got a general idea. I sterilized the jar, and I’ll leave it for a couple of weeks to see what turns out. I’m a bit excited! I always feel so accomplished putting something homemade into a jar!